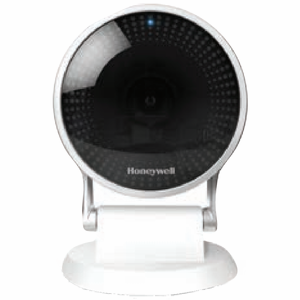 The Honeywell iPCAM-WIC2 is the next generation of video surveillance cameras that allows end-users to capture crisp, clear video of events and activities from Honeywell Total Connect 2.0. The iPCAM-WIC2 camera is ideal for monitoring your home, business or public facilities. For indoor applications, the new IPCAM-WIC2 offers up to 1080p at 30 frames per second, with a wide angle view of up to four detection areas. With the simple QR code-based setup, the iPCAM-WIC2 camera is faster and easier to install to the wireless network or access point. Wireless communications utilizes the 802.11b/g, and a Bluetooth capable device will be required for setup. The iPCAM-WIC2 includes the power supply, power supply adapter, microSD Card, quick installation guide and mounting kit. Color video can be monitored through your Mobile App and Total Connect remote services account. Up to 8 cameras can be used per location. Add to existing Legacy Cameras for support of up to 14 cameras per location. If using less than 8 new generation cameras, you may not increase the number of legacy cameras. The same goes for a legacy camera, if the less than 6 is being used, additional New generation cameras may not be increased. The built-in SD card ensures backup storage in the event of an internet outage and offers the option for 7-day or 30-day video storage. Night vision for low-light environments, digital zoom capabilities and flexible mounting options provide peace of mind. Please take note the Honeywell IPCAM-WIC2 security camera is not visible on the Lynx or Lyric touchscreen control panels, and is only visible utilizing the Total Connect 2.0 app. • Integrate with success - Works with proven winner Honeywell Total Connect Remote Services and Lyric™ security and home control systems. • Fast and easy installation - QR code installation with compact hardware and multiple mounting options - ceiling or tabletop. • Stay connected - Enhanced Wi-Fi® connectivity and range with 802.11n. • See near and far, light or dark - Wide angle views and sharper night vision with up to 1080p (IPCAM-WIC2 and IPCAM-WOC1) resolution. microSD Card: up to 64 GB SDXC, 8 GB included. (Provides backup storage in the event of an Internet outage).